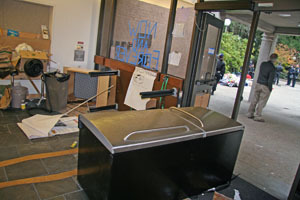 Refrigerator from staff break room found in the Kerr Hall lobby barricading front doors. 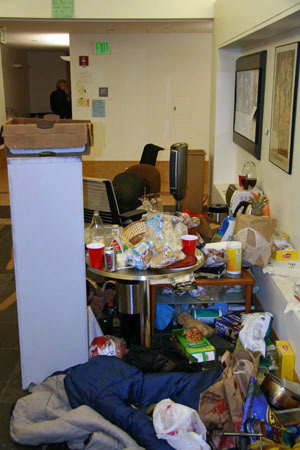 Kerr Hall lobby found littered with refuse. 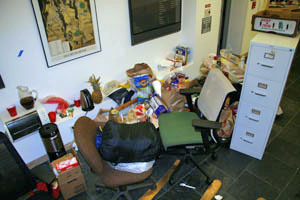 Reception desk covered with signs, leftover food. 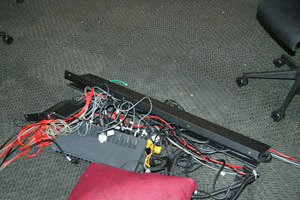 Electronic conferencing equipment ripped from disassembled tables in Kerr Hall 212, Chancellor's conference room. Kerr Hall lobby outside elevators. 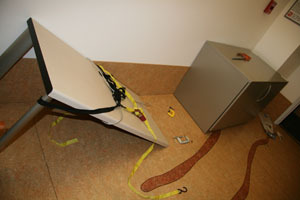 Broken table with nylon straps and C-clamps used as a barricade. Strapping and metal clamps found blockading doors. 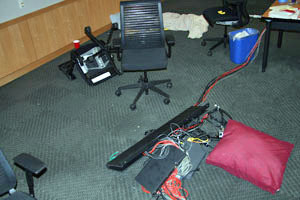 Conferencing equipment left scattered on Kerr 212 floor. Early Sunday morning, the occupation of Kerr Hall by students and others that began Thursday ended peacefully when approximately 70 individuals inside the building at that time left voluntarily. Their departure followed a demand from UC police that they vacate the premises or face arrest for unlawful assembly and trespass. There were no arrests. Students who participated in this incident face possible criminal and/or student judicial sanctions. 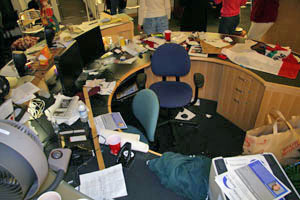 Certain areas of Kerr, particularly the second floor, were left damaged and in disarray. 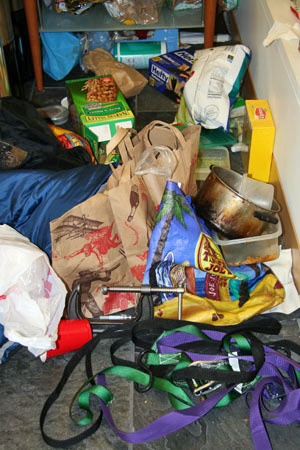 It will take much of today to document and assess the damage. The building will not be ready to be occupied on Monday; the second floor may remain closed for days. Police reported one injury to a bystander who apparently fell as a crowd of onlookers on the Kerr plaza was dispersing at the request of police. We want to express appreciation to Student Affairs staff and University police for displaying extraordinary poise and restraint in dealing with such a volatile situation; to Bill Ladusaw, professor of linguistics and vice provost of undergraduate education, and Peggy Delaney, professor of ocean sciences and interim Vice Chancellor of Planning and Budget, and others who participated in hours of dialogue seeking a peaceful, non-confrontational end to this incident; and to several other faculty, including Professor Bettina Aptheker, for their efforts this morning to persuade protesters to leave Kerr without further incident. Most of all, we want to express appreciation to the vast majority of UCSC students, faculty, staff and others who continue to so patiently cope with continued campus disruptions by a relative few. This great university, now more than ever, needs and deserves our collective constructive efforts, not destructive acts.